Filling your diet with anti-inflammatory foods is key to living a healthy lifestyle and taking care of your body. I don’t know about you, but I notice that every time I eat inflammatory foods, I feel bloated and sluggish, my skin breaks out, and my stomach is more sensitive than usual. That’s why I’ve been reading up on an anti-inflammatory meal plan that can help reduce inflammation in the body and make you feel better all around. If you’re not familiar with inflammatory foods, some examples are, peanuts, white sugar, red meat, deep fried foods, and foods that contain artificial chemicals, sweeteners, refined carbs, and trans fats. Even just hearing some of those words makes me shudder. These foods can lead to weight gain, skin problems, digestive issues, arthritis, drowsiness and even diseases such as diabetes and cancer. This 7-day anti-inflammatory diet will help you eliminate these foods and fill your system with clean, good-for-you foods that will help your body rather than harm it. Anti-inflammatory foods are high in natural antioxidants and protect against inflammation, which reduces your risk of disease. Incorporating an elimination diet for inflammation will get your system used to healthy, whole foods and reduce your cravings for things like sugar, refined carbs and deep fried “goodies”. Like any sort of diet, meal planning and preparation are key to success. Make sure you’re filling your fridge and pantry with anti-inflammatory foods so when you want to snack or eat a meal, you don’t reach for something quick and unhealthy. It’s so easy to go to your cupboard and grab a bag of chips or a handful of cookies, or stop by a fast food place on your way home. But planning ahead ensures you have foods in your home that you can enjoy and are good for you. When you’re on an anti-inflammatory meal plan, the best thing to do is figure out substitutes for some of your favorite not-so-good-for-you foods. For example, instead of eating glutinous pasta, grab a vegetable spiralizer and make zucchini or squash noodles. And instead of making a bagel with peanut butter and jam in the morning, invest in a good blender to make protein-filled smoothies. Want a list of anti-inflammatory foods you can and should eat? Having a grocery list ensures you always make the right decisions when you go to the store. Here’s an anti-inflammatory diet list to get you started. If you’re vegan, there are a host of anti-inflammatory foods you can eat, and if you’re not vegan but want to take your diet further and cleaner, you can consider the anti-inflammatory vegan diet. This diet consists of fruits, vegetables, whole grains, good fats, and proteins that are completely animal-free. You can still get tons of protein from foods like tofu, leafy greens, nut butter, lentils, quinoa and more. Incorporating an anti-inflammatory diet doesn’t mean you have to deprive yourself. As you’ll see with this meal plan, there are tons of delicious recipes, from chili lime salmon tacos with mango salsa to dairy free golden milk chia pudding. Below you’ll find recipes for a 7-day anti-inflammatory meal plan. 7 recipes for breakfast, lunch, dinner and snacks to take you through the week! 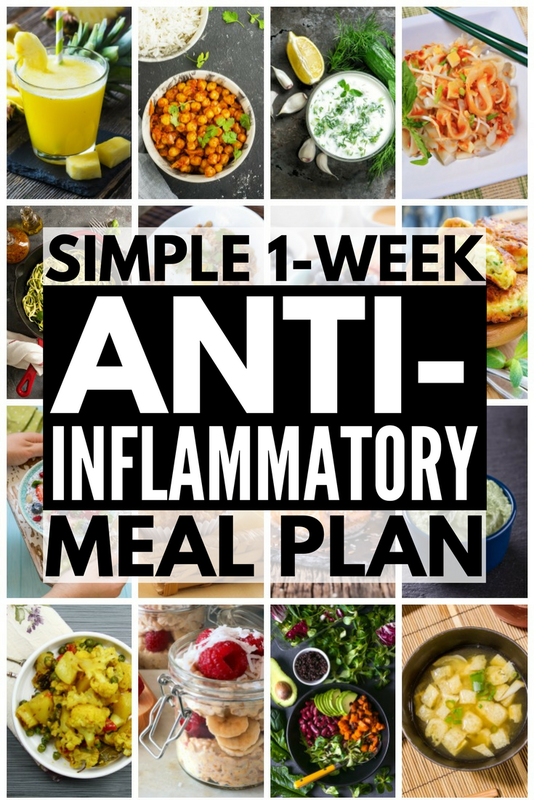 If you love this anti-inflammatory meal plan, please share it on Pinterest! And if you’re looking for more health tips, please follow our Health board on Pinterest!